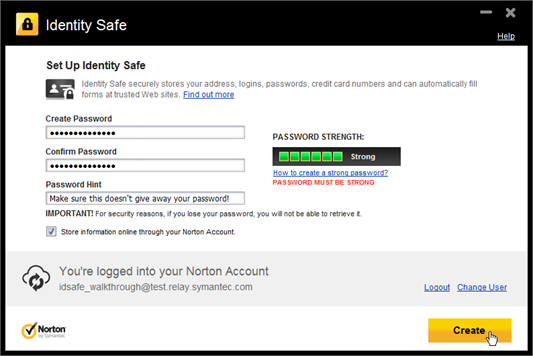 If you’ve been keeping up with Norton products, you probably already know that Norton Internet Security (NIS) 2012 included new capabilities that gave you the option to store your Identity Safe Vault (passwords, credit card numbers, and other data) in the Norton cloud and share it between all your computers with Norton Internet Security 2012. Up until now, however, your Vault could only be accessed from a computer with Norton Internet Security 2012 installed. Today we’re launching identitysafe.norton.com, a web portal which allows you to access your Identity Safe Vault from any web browser—useful, for example, when you’re at work, a café, or a friend’s house and can’t remember a password. 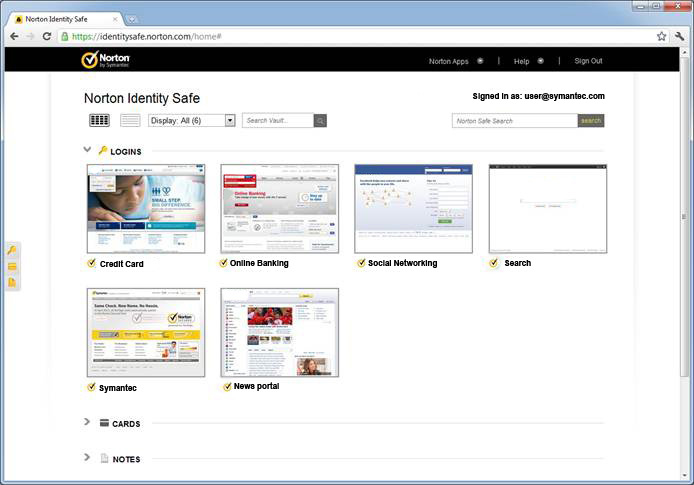 With the portal, you can view your logins, cards, and notes in the browser just like you could from within Norton Internet Security. In this post, I’ll walk you through how to get started with using the Identity Safe web portal. If you already have an online Vault, you’re all set to get started! Go ahead and skip down to the “Getting Started” section. Don’t worry if you don’t have an online Vault yet—we’ll walk through the whole setup process. The Identity Safe web portal is read-only, which means you can view your Vault but not create or modify it via the website. 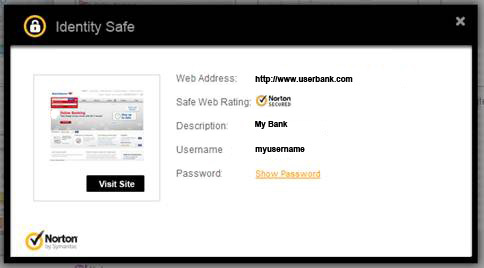 You’ll need a copy of Norton Internet Security 2012 to create your online vault. If you have an older version of NIS and a valid subscription, you can upgrade to NIS 2012 for free by navigating to Support | Check for New Version in the product’s main window. Otherwise, you can get a free trial copy at: http://us.norton.com/downloads/trialsoftware. If you don’t have a Norton Account, click “Create New Account” and follow the instructions. Otherwise, login to your account. We now need to set a Vault password, which is different from your Norton Account password. The Vault password will secure your Vault so that no one other than you can access your data. If you forget this password, not even we can unlock your Vault for you! In the Create Password box, type in your desired Vault password. The password strength must be “Strong”. Click the “How to create a strong password?” link to learn more about creating strong passwords. In the Confirm Password box, type your vault password again. In the Password Hint box, type in a hint for the password. Make sure that the hint doesn’t reveal anything about your password to anyone but you. Check Store information online through your Norton Account (this option appears only if you have logged in to your Norton Account). This is important! If you don’t check this, your data will not be synced to the Norton cloud and will not be accessible via the portal. You can now use the “Edit Cards”, “Edit Logins”, and “Edit Notes” links to add your data to your Vault. 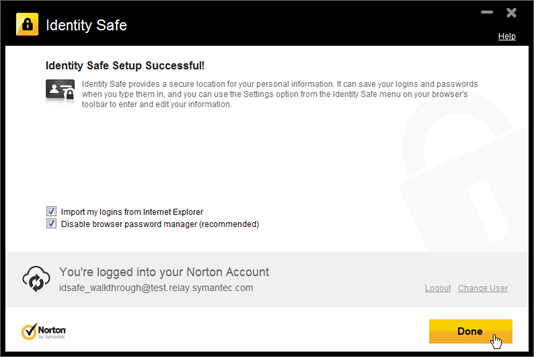 Norton Internet Security will automatically sync your data to the Norton cloud! Now that you have an online Vault set up, open your browser and point it to https://identitysafe.norton.com. Welcome to the Identity Safe web portal! You can switch between Logins, Cards, and Notes by clicking on the corresponding bars. There are also shortcuts on the left side of the page for quickly switching between the three types of items. Clicking on an item will pop up a dialog with the item’s info. To protect your private information from prying eyes, we hide your passwords and credit card numbers when your item dialogs are opened. Clicking on the “Show Password” or “Show Details” links will reveal your password or credit card numbers images. If you’d like to copy your password or card number to clipboard, click on the clipboard icon next to the image, and then click the copy to clipboard link in the popup. Just remember to clear your clipboard when you’re done. For your convenience we also provide a link for clearing the clipboard. That should be enough to get you started. If you have any questions or feedback, the Norton Users Forum is the place to voice them. We look forward to hearing from you! Yeah I saw this icon but when I tried last night it did not do anything. Wouldn't you know it though, I had only to restart my browser and it works now. I should have realized to try that last night. Normally I would have, I think I was just up too late last night. Thanks and I do like this portal. I think it is a necessary feature to tie into the online aspect of ID Safe management and portability! It doesn't seem that the portal is any different than the regular tool. I cannot access my vault through the regular tool or the portal. I have been having a lot of trouble accessing the vault the old way and when I saw this "portal", I thought it would be a perfect way to side step the access issues I've been having with the regular tool and access the vault directly. But it seems that the password validatin process is identical. After successfully accessing my account, I enter the vault e-mail and password. Them I get an error message - either of two different ones from time-to-time. Sometimes it is "Internal Server Error", and sometimes it is "The operation timed out. Please check your network connection and try again." I do enter the correct password. I know this because entering the wrong one gets me a prompt password error message. But entering the right one puts me into some kind of loop and then I get either of the above error messages. But there is nothing wrong with my network connection - this post is clear evidence that it is working. Please make the portal access a different system and process so I can retrieve all my passwords. I've been using identity safe for several years. When I tried to create a new cloud account it told me everything in my existing safe would be deleted! Something I certainly don't want. How can I overcome this problem and switch to using the cloud? This is a really GREAT feature but I do have one comment and a suggestion for improvement. Comment: when you click on Show Password it is a little hard to read the password because of the FONT being used and the strikethrough. Suggestion: it would be highly beneficial if you could copy/paste this password. 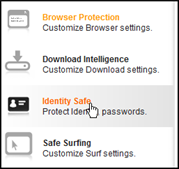 Since this is intended to help with situations where you need to access your ID safe information on a computer without Norton installed, being able to copy/paste the password would be much more user friendly. For anyone with a strong and complicated password it is sometimes difficult to have to not only read this password (which as I explained above is not the easiest thing) but also type it in manually and all without making mistakes. Is it possible to implement these suggestions? Other than that this is a GREAT feature as I said!! Thanks very much for considering my feedback. Online Vault and now Web Portal ~ While Symantec strives to re-invent the wheel. Um, how about improvements to the good ol' Local Vault. Lots of Topics re buggy ID Safe. How about improved Local Vault site recognition and site compatibility. Um, perhaps even multi-page logins. While ID Safe goes to the cloud. Maybe Symantec can also address the (minor) glitches with Local Vault users are reporting. @AllenM -- I'm happy to report that the copy/paste functionality is already a part of the Identity Safe Portal!